You're a passionate EC parent. But still, you feel a little awkward talking about elimination communication in public or with new parents. Sound familiar? You aren't the only one! We've all been there. We begin talking about EC, and in our heads it all sounds perfectly logical, as we know it is, but then we catch the look on the person's face across from us. Our fight-or-flight instincts kick in, and soon we're bumbling and apologizing, and then changing the subject to - literally - anything but this. 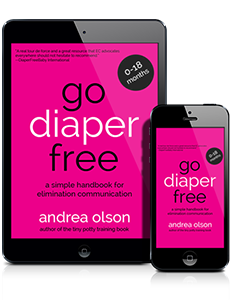 On today's episode of the Go Diaper Free Podcast, we will go over how to break the ice and inform others about elimination communication with confidence, and without sounding crazy. Have you talked to friends or family about elimination communication? Please leave a comment below with your experience! Yes, he’s eight months old and often uses a toilet! When he’s upset or farting, I hold him on there and he often goes! It’s less mess especially when he’s constipated and blowing out of every diaper, but I admit, he’s not potty trained as much as I am the one being potty trained ? 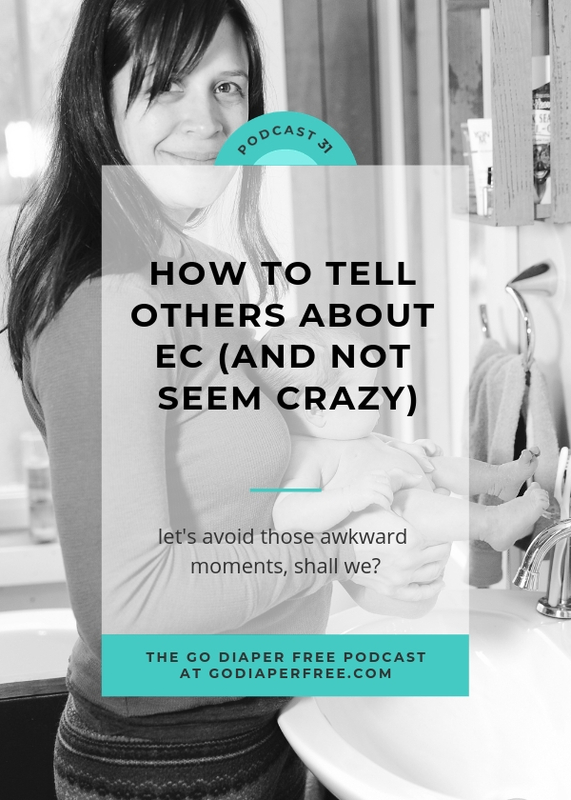 Even though I’ve been talking about EC for about 7 years now, I agree that it can still be awkward!! But I’ve always had the mindset that you have. I’m not there to convince someone to practice EC, but rather to INFORM and INSPIRE CONFIDENCE, if there’s interest. On a related note, I am presenting to the local Head Start program in about an hour. They’re interested in incorporating potty training and possibly EC into their curriculum, alongside things like nutrition, health, motor skills, language and literacy. This podcast release is so timely. It just gave me that extra boost to “sell” EC to the Head Start program in an informative, relaxed way. Thanks, Andrea!! I’ve talked about it with a few friends and family. Everyone thinks it’s great. They confuse it with potty training. I have to explain that it’s not. I don’t think they quite get it. My mom said it’s never too early to teach them to use the potty and my friend with a baby a few months older than mine was calling my little one so smart. I told her her baby could do it too and sent her a link to this site. She’s gonna try it out. I haven’t come across any naysayers so far. I have had surprisingly positive reactions from friends and family who are just amazed, and bewildered by it. What saddens me tho is that I feel people think it’s not something accessible to them, rather I am this dedicated, special, mystical figure making my life harder then it needs to be. All the new mums I know I have recommended they listen to your podcast as a starting point if they are interested. None of them have ever got back to me to say they have actually listened or given it a go though, which is a shame as it makes life much easier! I never clean dirty nappies or bum! And obviously the environmental impacts are so important and is something parents should be concerned about and talking about in 2019! I am grateful for your work, Andrea! My 9 month old is doing great, in our first month of EC. My mother-in-law did not react AT ALL when we told her. Later, I asked her about her home country. She told me that people finish using diapers on their babies at one year old, where she grew up, in The Philippines. She did the same with her children in the U.S.! You’ve talked a lot about other cultures and here’s another example!